Diversity in entertainment is loved by everyone and makes more money. So, why is Hollywood increasing diversity so slowly? The latest report by the UCLA called the "Hollywood Diversity Report" is described as "part of a series of analyses done for the Bunche Center’s Hollywood Advancement Project, which will track over time whether the TV-and-film industry is employing diverse groups of lead actors, writers, directors and producers and whether major talent agencies are representing them. The study also will identify best practices for widening the pipeline for underrepresented groups." The Ralph J. Bunche Center for African American Studies was founded in 1969 as the Center for Afro-American Studies (CAAS) and renamed after Nobel Prize winner, scholar, activist, and UCLA alumnus Ralph J. Bunche in 2003. They're last report sent ripples in the industry and this one should also make waves. The 2015 Hollywood Diversity Report tracked 347 theatrical films released in 2012 through 2013 and 1,105 TV shows during the 2012-2013 season. On cable, white and Latino viewers preferred casts with 31 percent to 40 percent diversity. What's really compelling about this report is that 2014 has shown an increase in these as well with TV shows with prominent minority leads like Scandal and How to Get Away With Murder at the top of the ratings. 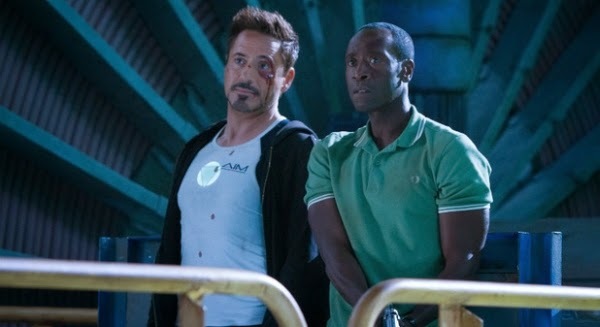 Iron Man 3, which featured a prominent Black superhero was the number two film at the box office. So, why are all these compelling numbers not driving bigger change? Darnell Hunt, the lead author of the report, says, "It’s a high-risk industry. People want to surround themselves with collaborators they’re comfortable with, which tends to mean people they’ve networked with—and nine times out of 10, they’ll look similar. It reproduces the same opportunities for the same kind of people: You’re surrounding yourself with a bunch of white men to feel comfortable. "It’s not like there’s this general trend upward, this wave everything is riding. It’s very precarious. It’s getting better, but it’s not getting better fast enough. And it’s still a big problem." I'd highly encourage you to read the full report at the Ralph J. Bunche Center for African American Studies website. It's a fascinating read and really shows how far we've come as a people and a culture and how far we have to go. What do you think of the report? Is it surprising? There will gradually become more diversity. It just takes time and for another generation to take over. I read recently that in thirty years whites will be the minority and Hispanics will be the majority. Sadly people don't mix and interact with a wider mix of people. I go to a very mixed church and have has many friends both black and white. I guess that's just rare. Movie and TV studios are like sports in that it's mostly a white boy's club. Cracking the ceiling is difficult, but reports like this are a good idea to try to use the proverbial carrot of financial benefits. Really there are so many movies now that make most of their money overseas in Europe, China, etc that it would behoove studios to have more diverse casts and less stereotypes. With an international audience it doesn't make sense to limit the races to White Americans Pat. But hiring starts at the top and that's where the change is going to come from. Hispanic are a growing population and gaining more and more buying power. As you know the more exposure people have to other people and groups the more diversity grows Alex . The increase might be slow now, but I bet it'll skyrocket in the years to come with the change of demographics. Excellent post! The generations after us are already trending respect and equality. The cul-de-sac I live in is very diverse, it is one of the reasons we bought the house. My kids play with Hispanic, Japanese, Filipino, and African American children. The more we see the diverse in the world around us, the more we will expect to see it in the media and entertainment. acceptance on screen, it will begin to overflow into reality. absolutely agree with you, Bella! this part "It’s not like there’s this general trend upward, this wave everything is riding. It’s very precarious. It’s getting better, but it’s not getting better fast enough. And it’s still a big problem” is my favorite) i remember when i studied in college i wrote film studies writing work like this! but in general I wanted to say that I was very nostalgic when I read the article. thank you!